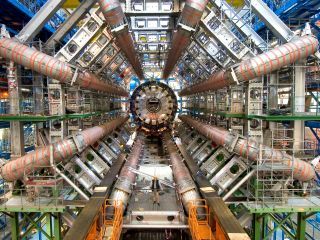 The Large Hadron Collider has achieved one of the greatest things ever in particle research, it has managed to recreate its very own mini Big Bang – the incident which lead to the creation of the universe 14 billion years ago. In a section of the LHC (to give the particle pusher its hip-hop name) known as Alice, scientists managed to smash together lead ions to create the not-very-big Big Bang. We're picturing this experiment in much the same way a child would smash two Lego toys together to see what the effects were, but we have a sneaking suspicion that more thought may have gone into it. This is because the Alice experiment involves around 1,000 physicists and engineers from 100 institutes in 30 countries. Of which Britain contributes eight physicists and engineers and seven PhD students from the University of Birmingham. Dr David Evans, a member of the UK team from the University of Birmingham, who probably now has something of a god complex, said about the experiment: "We are thrilled with the achievement. The collisions generated mini Big Bangs and the highest temperatures and densities ever achieved in an experiment. "This process took place in a safe, controlled environment generating incredibly hot and dense sub-atomic fireballs with temperatures of over 10 trillion degrees, a million times hotter than the centre of the Sun. "At these temperatures even protons and neutrons, which make up the nuclei of atoms, melt resulting in a hot dense soup of quarks and gluons known as a quark-gluon plasma." Quark-gluon plasma sounds a lot like Midi-chlorians to us, as Evans explains: "The Strong Force not only binds the nuclei of atoms together but is responsible for 98 per cent of their mass. "I now look forward to studying a tiny piece of what the universe was made of just a millionth of a second after the Big Bang." The experiment's 'highest temperatures ever on Earth' boast was short-lived, though, due to Katie Waissel's freezing cold reception on the X Factor counteracting the extreme heat.